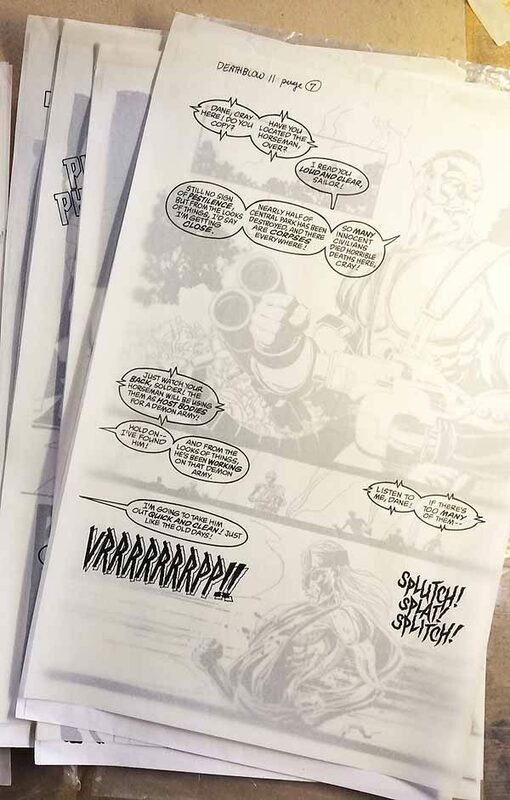 At Marvel in the 1990s we almost never photostatted the vellum overlays. We whited out the backs of the balloons on the vellum and pasted the actual lettering on the pages. I wonder why DC went to the time and expense of making stats of all the pages? Funny, I always thought your method, which I’ve heard of but never tried, sounded much more time consuming and therefore more expensive. I guess it’s all about what you’re used to. It does explain why I’ve never seen a Marvel lettering overlay. We’d have to crack open fifteen or twenty one ounce bottles of Pentel White Out, pour them into a plastic rubber cement jar/bottle (the kind that had the adjustable length one inch wide brush in the lid), brush the back of the vellum where the balloons were, and then when that was dry brush on some rubber cement. We’d knock out ten or so pages at once over in the prep area and then take them back to our desks to cut out and paste down.